1. Cast on 7 stitches (for the first leg), knit 14 rows and break off yarn. 2. Cast on 7 stitches on the same needle (for the second leg) and knit 14 rows. 3. Knit across both legs to join. 5. Cast on 7 more stitches (for the 1st arm) and knit to the end of the row. 7. Cast on 7 more stitches (for the 2nd arm) and knit to the end of the row. 8. Bind off 7 stitches to close the first arm and knit to the end of the row. 9. Bind off 7 stitches to close the second arm and knit to the end of the row. * Check! You should now have 14 stitches on your needle. 11. Cast on 7 more stitches (for the back of the 1st arm) and knit to the end of the row. 12. Cast on 7 more stitches (for the back of the 2nd arm) and knit to the end of the row. 14. Bind off 7 stitches to close the first arm and knit to the end of the row. 15. Bind off 7 stitches to close the second arm and knit to the end of the row. 17. 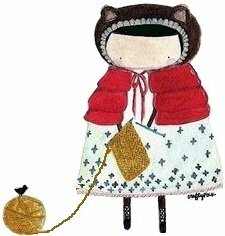 Knit only the first 7 stitches and then use a pin to temporarily hold the next 7 stitches. 18. Knit 14 rows and then bind off. 19. Return to the 7 stitches on temporary pin, knit 14 rows and bind off. 1. 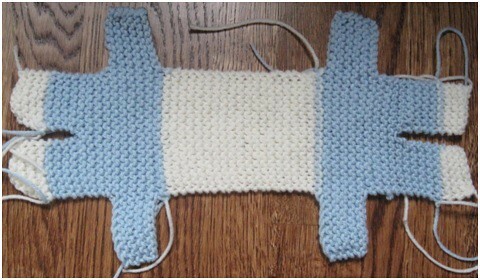 Fold knitted piece in half lengthwise. The fold becomes the top head top. Embroider eyes, nose and smile with sewing needle and thread. 2. Join seam around the bear leaving a small gap between the legs to insert the Poly-Fil. Turn right side out. Stuff the bear and sew opening close. 3. Sew a string of yarn all around the neck, pull the yarn to shape the neck and secure the ends. 4. Backstitch a diagonal line across each corner of the head to form the ears. 5. To knit bear scarf, cast on 60 stitches, knit 4 rows and bind off. Tie around the bear's neck and secure in place so it doesn't get lost during transportation. For the children's safety, please do not attach buttons or any other objects. Use only yarn and Poly-fill. *Our pattern produces small bears because the more bears we can fit in a luggage the more little hearts we can touch. Thank you for following the pattern! SC – Single Crochet CH – Chain, Use a size F or G hook with worsted weight or lighter yarn. Finished Teddy should be approx. 7” tall. The more bears we can fit in a luggage the more little hearts we can touch. Thank you for following the pattern! LEGS: Chain 8, SC in each stitch across (7 SC). Chain 1 at the end of each row except last. Work 8 rows for each leg. End off and make another leg to match. On the second leg, do not end off. Position legs side by side and Chain 1 then crochet across top of both to join (14 SC). BODY: Work 6 rows for body. Chain 1 at the end of each row except last. HEAD: CH 1, turn and SC. Work 24 rows for head (front and back). Chain 1 at the end of each row except last. SECOND SIDE OF BODY: CH 1, turn and work 6 rows for body. SECOND SET OF LEGS: CH 1, turn. (SC7) work a total of 8 rows. End off. Attach yarn at other side of body CH 1then (SC 7) and work second leg as first. End off. FINISHING THE BEAR: Fold body in half, matching up arms and legs. Sew or crochet around, leaving opening for stuffing. Stuff, then whipstitch opening closed. Weave a length of yarn in and out around the neck, drawing up tightly and knotting securely, pull ends through bear so they disappear. Pinch the corners of the ears then weave yarn to form small triangle and tie yarn. Embroider eyes, nose and mouth in colors of your choice. Look at some of the cute faces we have on the Knitting without Borders website to get ideas. Make a cute scarf and secure it in one place to the bear so the child won’t be able to pull it off. And now you have a cute cuddly bear that will bring a smile to a child’s face! For the safety of the children, please do not attach buttons or any other objects. Use only yarn and Poly-fil. Per la prima gamba, avviate 7 maglie e lavorate per 14 fila. Tagliate il filo e lasciarlo in sospeso. Sullo stesso ferro, avviate 7 maglie per la seconda gamba e lavorate per 14 fila. A questo punto dovreste avere tutte due le gambe sullo stesso ferro. Se non e' cosi, lavorate 1 altra fila. Avendo tutte e due le gambe sullo stesso ferro, lavorate la prima gamba. Troverete il filo che avevate tagliato appartenente alla prima gamba, fate un nodo con il filo che state lavorando e continuate a lavorare anche la seconda. Cosi’ facendo, avrete unito le gambe. Aggiungete 7 nuove maglie (per il secondo braccio) e lavorate la fila completa. Chiudete 7 maglie e continuate a lavorare le rimanenti maglie fino alla fine della fila. Chidedete 7 maglie e continate a lavorare le rimanenti maglie fino alla fine della fila. Chidedete 7 maglie e continate a lavorare le rimanenti maglie fino alla fine della fila..
Continuate a lavorare le maglie che sono sul ferro, per altri 13 fila e poi chiudere. Tornate alle maglie messe in sospeso, e lavorate 14 fila. Chiudere. L’orsetto e’ fatto. Con un ago, create occhi, naso e sorriso. Piegate l'orsetto a meta', e assicurandovi che occhi, naso e bocca siano all'interno, cucite i lati, lasciando una apertura per l'imbottitura. Capovolgere, riempire e chiudere l'apertura finale. Imbottire l'orsetto. Cucire un filo tutto intorno al collo e tirarlo un po per formare il collo. Fate una piccola sciarpina per l'orsetto e fissatela con due punti nella parte di dietro dell'orsetto per non farla perdere. Uncinetto N° 4. L'orsetto si lavora tutto a Punto Basso. Fare 8 catenelle e lavorare per 8 fila. Chiudere con un punto bassissimo e tagliare il filo, lasciandone un 4-5 cm per poter legare poi l'altra gamba. Fare di nuovo come l'inizio per l'altra gamba, pero' non tagliare il filo questa volta. A questo punto, nella seconda gamba lavorare un'altra fila e legare il filo della prima gamba alla seconda e terminate la fila che permetterà alle due gambe di essere unite. Lavorare 6 fila per creare il corpo. Proseguire così per 5 fila, pero' nella quinta fila lasciate senza lavorare le ultime 7 maglie. Adesso lavorare 16 maglie per 10 fila, per formare la testa. Continuare altre 10 fila per creare la parte di dietro della testa. Adesso lavorare 16 maglie per 6 fila per formare il corpo. Riprendere da dove avete lasciato le 8 maglie e lavorare per 8 fila, poi chiudere con un punto bassissimo. A questo punto l'orsetto è fatto. Con un ago, create occhi, naso e sorriso. Imbottire l'orsetto. Cucire con un filo dello stesso colore dell'orsetto intorno al collo e tirarlo un po' per formare il collo. Inserire un filo nella parte delle orecchie e fare un paio di punti per formare le orecchie. Fate una piccola sciarpa per l'orsetto e fissatela con due punti nella parte di dietro dell'orsetto per evitare che si smarrisca o che il bambino possa staccarla. Si prega di non usare bottoni o perline per occhi ed altro, per evitare che i bambini possano ingerirli. 13. Utilizando solo los primeros 7 puntos (coloca en un gancho los otros 8 puntos), tejer 14 hileras y luego cerrar los puntos. 14. Volviendo a los 7 puntos que quedan, tener 14 hileras y luego cerrar los puntos. 15. Decide en cual lado quieres hacer la cara y usando una aguja, crear los ojos, la nariz y la boca del osito. 17. Rellenar el osito y cerrarlo. 18. Cocer un hilo alrededor de cuello y luego apretarlo para formar el cuello. 19. Con hilo y aguja, cocer en los dos lados de la cabeza para formar las orejitas. For the seguridad de los niños, no use botones u otros objetos que puedan poner en peligro la vida de los niños . Por favor use solo hilo y algodón sintético.